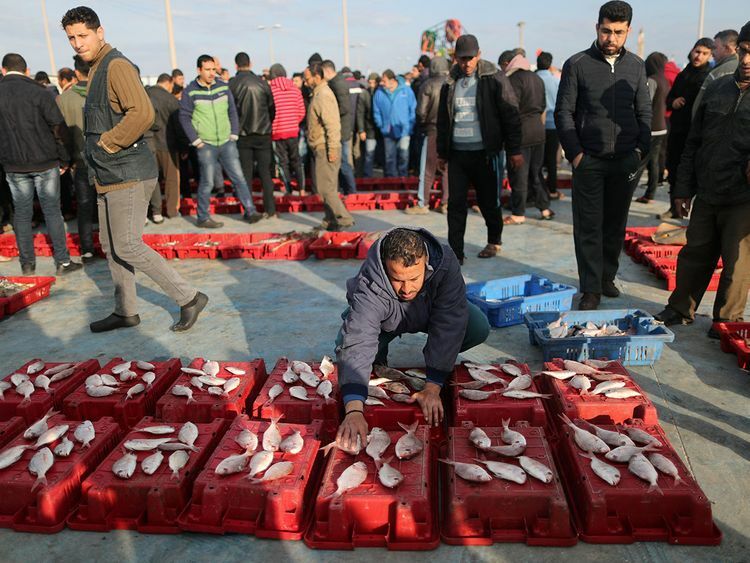 Gaza - As their rickety motorboats puttered out into deep Mediterranean waters for the first time in almost two decades, the Palestinian fishermen prayed for deepwater mackerel and tuna to supplement Gaza's usual shallows fare of sardines, shrimp and crab. Israel keeps a naval cordon on Gaza, part of a blockade it and neighbouring Egypt say is necessary to prevent arms smuggling by the Hamas Islamists that rule the coastal territory. Israel has long limited Palestinian fishing waters, and has varied the size of the zone. It was tightened to just 6-9 miles (9-15 km) from the coast in recent years. But on Monday, Israel broadened the limit to 12-15 miles (19-24 km) out, its widest since 2000, before a Palestinian revolt erupted. "This step is part of the civilian policy aimed at preventing a humanitarian deterioration in the Gaza Strip and reflects the policy of distinguishing between terror and the uninvolved populace," an Israeli official said. Palestinians saw the move as an Israeli concession to a year of protests at the border, combined with several surges of cross-border fighting which have prompted mediation by Egypt, the United Nations and Qatar on ways to help Gaza's economy. "Thanks to God and then to the 'March of Return', which opened up the sea for us," al-Amoudi said, referring to the weekly demonstrations at the frontier, which demand a lifting of the blockade and the right for Palestinians to return to homes their families fled or were forced from when Israel was founded. April to June are peak Gaza fishing season. The sector accounts for less than 5 percent of the enclave's GDP and supports some 50,000 people, a fraction of the 2 million population. But the fishing has value beyond the numbers, as one of the few viable industries in Gaza, where more than half the population is unemployed and nearly 80 percent receive some form of aid, according to the World Bank. With Gaza's land borders tightly controlled by neighbouring Israel and Egypt, the sea's horizon provides many Palestinians with a glimpse of hoped-for freedoms of movement in the future. The U.N. Middle East envoy Nickolay Mladtenov welcomed Israel's decision to increase the fishing zone, adding: "(I) urge for a substantial improvement of the movement and access for goods and people, including between Gaza and the West Bank." He said that the United Nations its partners have raised about $45 million that would allow the creation of around 20,000 jobs in Gaza this year. The fishermen still have it hard, with fuel and spare parts for their boats scarce. They say that Israel has also barred the importation to Gaza of wire cables that would allow them to line nets for plumbing the depths. But fisherman Wael Abu Mohammed was still cautiously upbeat. "With 15 miles now we will be comfortable, if there are no problems with the Israelis," the father of 10 said. "We hope for the best." The past year has been the deadliest in Gaza since the last war between Hamas and Israel five years ago, with nearly 200 Palestinians killed by Israeli forces at the border demonstrations. One Israeli soldier was killed. United Nations investigators say Israel has used excessive force. Israel says it has no choice but to use deadly force to protect the border from militants and infiltrators. The Israeli navy has in the past fired on Palestinian boats that strayed from the fishing zones, sometimes impounding the vessels and detaining their occupants. In addition to smuggling, Israel worries about seaborne attacks. In the 2014 Gaza war, Hamas frogmen swam from Gaza to storm an Israeli coastal base. The Israeli official said that maintaining the expanded zone for Gaza fisherman "depends on (them) honouring the agreements" and that any attempt to venture beyond it "will be handled accordingly by the (Israeli) security services".